The Berkeley City Council held a closed session meeting on September 20 to discuss with their lawyers the status of ongoing litigation pertaining to the cell phone "right to know" law (CTIA v Berkeley) and another legal case. Prior to the closed session, the council heard public comments from about eight speakers in support of the cell phone ordinance. The speakers included Max Anderson, a former council member who sponsored the ordinance in 2015, and Ellen Marks, founder of the California Brain Tumor Association. This landmark ordinance is sound from a policy and legal perspective. The law has received substantial local and national media coverage which has helped spread an important public health message throughout the country. The city has prevailed at every level in the federal judicial system in defending the ordinance against the CTIA's lawsuit. At the conclusion of the public hearing, the council discussed the case with the City Attorney and Harvard Law Professor Lawrence Lessig, the lead attorney who is working on this case pro bono. When the council re-convened in open session, they re-affirmed the city's commitment to defend the law against the CTIA's lawsuit. News coverage of this meeting: Daily Californian and CBS San Francisco. The U.S. Supreme Court issued a ruling in CTIA v. Berkeley today. The CTIA had petitioned the Supreme Court to overturn the ruling made by the Ninth Circuit Court of Appeals. The appeals court had ruled against the CTIA's request for a preliminary injunction that would block the city's cell phone "right to know" ordinance pending resolution of the case. The ordinance was adopted in May, 2015 and has been in effect since March, 2016. Instead of hearing the case, the Supreme Court sent the case back to the appeals court for further consideration. The Supreme Court wants the appeals court to review CTIA v. Berkeley in light of a new ruling in another case. In NIFLA v. Becerra, the Supreme Court invalidated a California law that requires "pregnancy crisis centers" to provide information to patients about the availability of abortion services. Since these centers try to stop women from having abortions, they are opposed to providing their patients with such information. Berkeley provided the lower court with empirical evidence that most residents are unaware of the safety information that cell phone manufacturers provide. Yet, the Federal Communications Commission requires manufacturers to disclose the cell phone's minimum body separation distance and recommend to consumers the use of an approved holder that complies with this separation distance. The city requires cell phone retailers to display the above factual notice. The notice does not make any claims about health risks from cell phone use. Since the ordinance has been in effect for more than two years without creating any controversy among consumers or disruption to cell phone retail businesses in the city, it is uncontroversial. The Berkeley cell phone "right to know" ordinance requires cell phone retailers to provide consumers with "purely factual and uncontroversial disclosures about commercial products." Hence, the ordinance will likely withstand legal challenges from the CTIA and its corporate allies. SCOTUSblog has a summary of the issues, chronology of the filings, and links to all briefs submitted to the Supreme Court. The CTIA and the City of Berkeley filed a joint brief today with the federal district court in northern California to place a hold on their case until the U.S. Supreme Court decides whether to hear the CTIA's case against the city's cell phone "right to know" ordinance. Although the Supreme Court held a meeting about the case on May 10, 2018 to consider the CTIA's petition, the court has yet to issue a decision. The CTIA -The Wireless Association has petitioned the United States Supreme Court to hear their case against the City of Berkeley’s cell phone “right to know” ordinance. The CTIA argues that the ordinance forces cell-phone retailers to deliver a misleading and controversial message to customers. The city asserts that the message is “literally true”; moreover, the city has a legitimate interest in protecting the health of its residents. The city prevailed in the federal district court and in the Ninth Circuit Court of Appeals. In October of last year, the appeal courts denied the CTIA’s request for a hearing before the full court. The case, “CTIA - The Wireless Association, Petitioner v. City of Berkeley, California, et al.,” was filed on the Supreme Court docket on January 9, 2018 as No. 17-976. The CTIA is represented by Theodore Olson, a former U.S. Solicitor General, from the law firm Gibson Dunn & Crutcher LLP. The city is represented by Harvard constitutional law professor Lawrence Lessig, Amanda Shanor, a Ph.D. candidate at Yale Law School, and Farimah Brown and Savith Iyengar of the Berkeley city attorney’s office. The CTIA’s petition and appendix can be downloaded from the Supreme Court’s web site. Yesterday the CTIA submitted a statement to the federal district court regarding future management of the case. The CTIA indicated that it may petition the Supreme Court for a hearing even though the appeals court denied an en banc hearing. According to the statement, both parties to the case have agreed that discovery and a trial is unnecessary, and neither party is willing to settle the case. The CTIA has until January 9, 2018 to petition the Supreme Court for a hearing. The city of Berkeley won a decision in the federal appeals court today. The 9th Circuit Court of Appeals refused to reconsider its April decision to uphold a Berkeley ordinance that requires cell phone retailers to warn customers about possible radiation exposure. The court rejected arguments made by the CTIA--The Wireless Association which argued for an en banc hearing of the case by a panel of eleven appeals court judges. The majority opinion stated that upholding the court’s prior decision is consistent with four other circuit courts that have held government's right to compel “purely factual” commercial speech to serve a compelling government interest, even in the absence of consumer deception. The Natural Resources Defense Council submitted a brief to support the City of Berkeley. The Association of National Advertisers, the American Beverage Association, and the Chamber of Commerce submitted briefs in support of the CTIA. The court's ruling can be downloaded at http://bit.ly/9thCircuitRuling. Today Reuters summarized the federal appeals court ruling on the Berkeley cell phone radiation case in an article entitled, "When the government can make businesses talk." For other news accounts, see http://bit.ly/berkeleymedia. Today the city of Berkeley won a major decision in a federal appeals court. The court denied a request by the CTIA--The Wireless Association to block Berkeley’s landmark cell phone “right to know” ordinance. Although the federal appeals court hearing only addresses the industry's request for a preliminary injunction, the ruling bodes well for the City because the industry’s argument in the overall case for killing the ordinance is based upon the First Amendment and federal preemption. The court rejected those arguments stating that that the ordinance is in the public interest as it complements and reinforces existing Federal law and policy. More information about the ordinance and the lawsuit appears below. 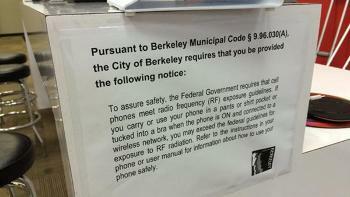 For links to media coverage see: Berkeley Cell Phone "Right to Know" Ordinance: Media Coverage. The ruling by the U.S. Court of Appeals for the Ninth Circuit can be downloaded from http://bit.ly/CTIABkly042117. “The panel affirmed the district court’s order denying a request for a preliminary injunction seeking to stay enforcement of a City of Berkeley ordinance requiring cell phone retailers to inform prospective cell phone purchasers that carrying a cell phone in certain ways may cause them to exceed Federal Communications Commission guidelines for exposure to radio-frequency radiation …. … the panel held that the City’s compelled disclosure of commercial speech complied with the First Amendment because the information in the disclosure was reasonably related to a substantial governmental interest and was purely factual. Accordingly, the panel concluded that plaintiff had little likelihood of success on its First Amendment claim that the disclosure compelled by the Berkeley ordinance was unconstitutional. The panel determined that there was little likelihood of success on plaintiff’s contention that the Berkeley ordinance was preempted. The panel held that Berkeley’s compelled disclosure did no more than alert consumers to the safety disclosures that the Federal Communication Commission requires, and to direct consumers to federally compelled instructions in their user manuals providing specific information about how to avoid excessive exposure. The panel held that far from conflicting with federal law and policy, the Berkeley ordinance complements and reinforces it. In affirming the denial of a preliminary injunction, the panel further determined that there was no irreparable harm based on the First Amendment or preemption, that the balance of equities tipped in Berkeley’s favor, that the ordinance was in the public interest, and that an injunction would harm that interest. Although it has been five months since the federal appeals court hearing, the three-judge panel has yet to rule on the request by the CTIA to block enforcement of the Berkeley cell phone "right to know" ordinance until the CTIA's lawsuit against the city is adjudicated. In the meantime the law is in effect. Judge Edward M. Chen has scheduled a case management conference in federal district court on March 23rd. CTIA - The Wireless Association appeals from the order dissolving a preliminary injunction in its suit challenging a Berkeley ordinance that requires cell phone retailers to provide a certain notice regarding radiofrequency energy emissions. To listen to the live audio feed from the courtroom tomorrow go to http://www.ca9.uscourts.gov and click on the link listed at "Live Streaming Oral Arguments CR1." Due to media interest in this case, the hearing has been scheduled for 9:30 A.M. Pacific time. On September 13, the Ninth Circuit Court of Appeals will hold a hearing to consider whether to overturn the district court's decision that denied the CTIA's request for a preliminary injunction to block implementation of Berkeley’s cellphone ordinance until the case was decided. Berkeley's law has been in effect since March after the Circuit Court decided to uphold the federal district court's decision to deny the CTIA's request for a preliminary injunction. This landmark cellphone "right to know" law requires cellphone retailers in Berkeley to post a cellphone safety notification or provide a copy to customers. The notification reminds the consumer to read the manufacturer’s safety information in the cellphone’s user manual. The case before the federal Court of Appeals is CTIA-The Wireless Association v. City of Berkeley et al., case number 16-15141. The CTIA is represented by former Solicitor General Theodore Olson, and the City is represented by Harvard Law Professor Lawrence Lessig. The hearing will be held in the U.S. Courthouse in San Francisco at 9:30 A.M. (95 Seventh Street, Courtroom 1, 3rd Floor, Rm 338). Following is a recap of key legal developments since March. In March, the CTIA appealed the Court's ruling that denied the CTIA's motion for a preliminary injunction and allowed the City of Berkeley to implement its cellphone “right to know” ordinance. In April, the City submitted a brief to the Court which argued that the CTIA’s misinterpretation of the First Amendment would severely limit government’s regulatory powers, and if the Court were to support the CTIA’s arguments, numerous federal, state, and municipal laws would be ruled unconstitutional (“Berkeley Defends Cellphone Warning Ordinance At 9th Circ.,” Law 360, Apr 5, 2016; https://www.law360.com/articles/780474). California Attorney General Kamala Harris and the Natural Resources Defense Council submitted amicus briefs in support of Berkeley’s position. Both the Attorney General and the NRDC warned the Court against holding governments to a higher level of First Amendment free speech protection scrutiny when they are simply mandating disclosures. The Attorney General argued, “If the approach advocated by CTIA were adopted by this Court, an array of consumer protection laws, long recognized as a constitutional exercise of the state’s police powers under the authority cited above, could be called into question.” (“Calif. AG Tells 9th Circ. Phone Warning Rule Merits Leeway,” Law360, Apr 26, 2016; https://www.law360.com/articles/788952). In May, the CTIA submitted a brief to the Appeals Court which argued that the FCC does not require radio frequency disclosures. The City pointed out in its response that the CTIA had previously agreed that the FCC required these disclosures, and that the Appeals Court should not consider new arguments. Moreover, the City claimed that the CTIA’s current assertion was false (“Berkeley Rips Group's FCC Radiation Rule Claims At 9th Circ.,” Law360, May 13, 2016; https://www.law360.com/articles/796300). In August, the Appeals Court ruled that it would consider the CTIA’s new argument and asked the City to submit its rebuttal (“City Can't Block FCC Radiation Rule Arguments, 9th Circ. Says,” Law360, Aug 12, 2016; http://www.law360.com/telecom/articles/8277850). On August 25, the City of Berkeley submitted to the Court a rebuttal to the CTIA’s new claim. The CTIA argues that it is not mandatory for cellphone manufacturers to report SAR values and the minimum separation distance in user manuals. Their argument is based on two Knowledge Database (KDB) publications that the FCC issued in October, 2015: KDB 212821 and KDB 447498. KDB documents, however, are issued by FCC staff to clarify existing FCC rules, not to alter them. Such documents are not subject to public review and do not have the force of law. Hence, the Court is unlikely to consider the CTIA’s new argument to be valid. (“Berkeley Slams CTIA's Flip-Flop In Cellphone Warning Row,” Law360, Aug 29, 2016; http://www.law360.com/telecom/articles/833616). Today, the Ninth Circuit Court of Appeals denied a request by the CTIA--The Wireless Association to halt enforcement of Berkeley's cell phone "right to know" ordinance according to the San Francisco Chronicle. The CTIA appealed to the Circuit Court because Judge Edward Chen of the Federal District Court allowed the ordinance to take effect while the case is being litigated. Judge Chen rejected the industry's arguments that the city was violating retailers’ free speech rights by requiring them to communicate a message they opposed. The Circuit Court vote was 2-1 with Judges Milan Smith and Morgan Christen voting to keep the ordinance in effect during CTIA’s appeal whereas Judge Carlos Bea dissented. Since the Berkeley cell phone ordinance took effect today, I conducted a small observational study around 4:30 PM to see which downtown cell phone stores were in compliance. The ordinance allows retailers to choose between posting the official Berkeley cell phone notice or providing customers with a handout containing the same information. I visited six cellphone stores in downtown Berkeley. At each store I asked to see the posted notice or the handout. Four of the six stores were in compliance. The four major cell phone retailers, AT&T, Sprint, T-Mobile, and Verizon, were all in compliance. All four posted the official notice on the counter or on a wall (Sprint). None opted to provide handouts to consumers. The two authorized cellphone resellers were not in compliance. The sales clerks were unaware of the new law. In one store after I described the ordinance, the clerk volunteered that the law was a good idea and asked me how to get a copy of the official notice. Max Anderson, the Council member who sponsored this ordinance stated to NBC News, "The people selling these products are not selling them for your good, They're selling them for profit. They play fast and loose with regulations." The goal is to get people thinking about keeping phones away from their body. The Association of National Advertisers filed a brief in support of the CTIA which sued the city of Berkeley over its cell phone "right to know" ordinance (Tom Lochner. "Advertisers group weighs in against Berkeley cellphone hazards disclosure requirement." Contra Costa Times, Mar 8, 2016). The advertisers association argues, "While the city is entitled to hold or express its own opinions about cellphone safety, it may not require others to mouth its words or be its microphone." The advertisers recommend that the City buy advertising if it wishes to inform consumers to read the cellphone manufacturers' safety instructions. Last September, Consumer Reports published an article entitled, "Does Cell-Phone Radiation Cause Cancer?" The article highlights the importance of the Berkeley cell phone ordinance and calls on manufacturers to prominently display advice on steps that cell-phone users can take to reduce exposure to cell-phone radiation. Because the Federal Court refused to block implementation of Berkeley's landmark cell phone "right to know" ordinance, the CTIA has asked the Ninth Circuit Court of Appeals to issue a preliminary injunction to stop the law from going into effect. The CTIA claims that cell phone retailers would be harmed by delivering a message they don't believe, and that the ordinance is likely to be eventually overturned by the courts. (Patrick Boyle. "CTIA urges 9th Circ. to halt Berkeley's cellphone warning law." Law 360. March 2, 2016. http://bit.ly/1TSD8i2). According to the Berkeley City Attorney's office, the law will go into effect on March 21. On January 27, the Federal Court (Judge Chen) lifted the ban on the Berkeley cell phone ordinance. The city is now allowed to enforce the amended cell phone law which requires cell phone retailers to notify their customers about the safety warnings in their cell phone or cell phone manual. The judge affirmed Berkeley's right to warn its citizens about potential health risks based on federal safety standards. In his ruling, the judge rejected the CTIA's argument that the city's mandated disclosure is controversial and therefore bound by a stricter constitutional analysis. According to the ruling, "CTIA's beef should be with the FCC ... If CTIA believes that the safety margin is too generous because there is no real safety concern at that level, it should take that matter up with the FCC administratively." See Courthouse News Service for a summary of the January 21 hearing and the subsequent ruling. A hearing on the CTIA's motion to sustain the court's preliminary injunction is scheduled for January 21, 2016 in Courtroom 5 in the federal district court in San Francisco. Judge Chen will hear the motion. On October 27, the second reading of the amended cell phone ordinance which appeared on the consent calendar was unanimously adopted by the Council. Next the city will submit a motion to the court to dissolve the injunction. This would enable the revised law to take effect. Last night the Berkeley City Council adopted a minor amendment to the city's cell phone ordinance. The Council deleted from the 82-word official notification the 7-word sentence regarding children's risk of exposure due to Judge Chen ruling that because the FCC failed to recognize that children's exposure to cell phone radiation is greater than adults, this sentence was "controversial." The peer-reviewed research which demonstrates that this is factual apparently is irrelevant to the court. Since there were no objections to the modified language, the item was moved to the consent calendar. A second reading of the ordinance will occur on October 27. On October 6 the Berkeley City Council will consider a minor amendment to the city's cell phone "right to know" ordinance at its regular meeting. The amendment will make the ordinance consistent with the order issued by the U.S. District Court in CTIA v City of Berkeley (USDC ND CA C-14-2529). Seven words pertaining to children's safety will be deleted from the city's consumer safety notification: "This potential risk is greater for children." Assuming the revised ordinance is adopted by the Council, the City will ask the court to dissolve the injunction. The Interim City Manager's memo to Council members which includes the U.S. District Court ruling is available at http://bit.ly/1KHAF2F. Recommendation: Adopt first reading of an Ordinance amending Section 9.96.030.A consistent with the order issued by the U.S. District Court in CTIA v. City of Berkeley (USDC ND CA C-15-2529 EMC). Judge Chen denied the CTIA's request for a preliminary injunction that would have completely blocked enforcement of the ordinance until the case was fully resolved. The Court required the City to strike the following seven words from the 82-word safety warning: “This potential risk is greater for children.” The judge ruled that although this sentence may be factual, it can be argued that it is controversial because the FCC does not acknowledge that children's exposure to cell phone radiation is greater than adults. For the facts supporting this assertion, see "Children are more exposed to cell phone radio-frequency radiation than adults." "I am pleased to report that in spite of massive attacks by the corporations they were unable to persuade the judge from taking away the consumer’s right to know in a drastic injunction. Instead the judge requested one simple sentence to be modified. The City is moving rapidly to vote on October 6th on that one sentence modification. Thank you all for your incredible efforts on behalf of the consumer’s right to know." “Judge Chen’s order upholding the main part of our cell phone ordinance confirms that the cell phone industry’s claims were ill founded,” Bates said. "The rest of the ordinance survived First Amendment review, which was a very important victory and I couldn't find a single sentence in Judge Chen's opinion that I disagreed with, so I'm quite happy," he said. "Judge Chen has issued a very careful and well crafted opinion upholding almost every part of the Berkeley “right to know” ordinance. (The one part he found preempted was the part that said that the risk of overexposure was greater for children.) Importantly, the Court rejected the First Amendment claims made by CTIA. Really happy to have had a chance to participate in getting this corner of the law right." “ … CTIA completely ignores the fact that the speech rights at issue here are its members’ commercial speech rights …. CTIA’s members are being compelled to communicate a message, but the message being communicated is clearly the City’s message, and not that of the cell phone retailers… (providing that the notice shall state 'The City of Berkeley requires that you be provided the following notice” and that “the notice shall include the City’s logo'). In other words, while CTIA’s members are being compelled to provide a mandated disclosure of Berkeley’s speech, no one could reasonably mistake that speech as emanating from a cell phone retailer itself. Where a law requires a commercial entity engaged in commercial speech merely to permit a disclosure by the government, rather than compelling speech out of the mouth of the speaker, the First Amendment interests are less obvious. Notably, at the hearing, CTIA conceded that there would be no First Amendment violation if the City handed out flyers or had a poster board immediately outside a cell phone retailer’s store." A case management conference has been scheduled for October 1 in the Federal District Court. On August 20, the U.S. District Court in San Francisco held a hearing on the CTIA's motion for a preliminary injunction to block implementation of the Berkeley cell phone "right to know" ordinance. The CTIA was represented by former U.S. Solicitor General Theodore Olson, and the City of Berkeley was represented by Harvard Law Professor Lawrence Lessig. The presiding judge is Edward M. Chen. Of the 240-plus federal district judges appointed in the U.S. in the past five years, Judge Chen is considered one of the "rising stars," because he is the fourth most-cited judge. Judge Chen is likely to issue a decision about the CTIA's injunction within the next few weeks. 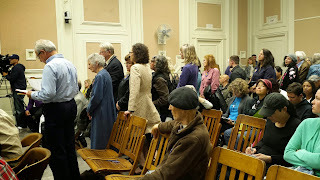 For links to other media coverage about the hearing and the ordinance see http://bit.ly/berkeleymedia. cell phone retailers to provide the following safety notice to their customers? Why is the CTIA trying to suppress this 82-word notice? On July 20, the CTIA filed with the Court its reply to the City of Berkeley. The CTIA wants the Court to issue a preliminary injunction that would block implementation of the cell phone “right to know” ordinance until the lawsuit is resolved. The CTIA claims that the ordinance should be subjected to “heightened scrutiny” and does not achieve “any substantial or even legitimate government interest.” Other CTIA claims include the ordinance is “misleading, not purely factual,” and that it is “controversial, “unduly burdensome,” and unlike other consumer disclosures. The CTIA argues that the ordinance is preempted by Federal regulation, and that members of the CTIA will be “irreparably injured if the ordinance is enforced.” Finally, the CTIA claims that the“injunction will not harm the City,” and would serve the public interest. A hearing on the CTIA's motion for a preliminary injunction to block implementation of the Berkeley cell phone "right to know" ordinance is scheduled for August 20 in the U.S. District Court in San Francisco. The hearing will be held in Courtroom 5 at 1:30 PM. The Honorable Edward M. Chen is the presiding judge. The case number is 3:15-cv-02529. Legal filings are available from the U.S. Court Archive, PlainSite, and Law360. On July 13, the Natural Resources Defense Council (NRDC) petitioned the Court for the right to file a "friend of the court" brief in opposition to the CTIA's motion for a preliminary injunction. The NRDC is a nonprofit environmental and public health advocacy organization with more than 2 million members including 1,244 members who reside in Berkeley. The NRDC is "One of the nation's most powerful environmental groups" according to the New York Times. "Part of NRDC’s mission is to protect public health by minimizing human exposure to harmful substances. Regulations like Berkeley’s radiofrequency exposure right-to-know ordinance are important to advancing that goal: after all, an individual cannot choose whether to minimize her exposure if she does not know that it is occurring. (1) National Resources Defense Council. CTIA v City of Berkeley. "[Proposed] brief of amicus curiae National Resources Defense Council in opposition to plaintiff's motion for preliminary injunction." US District Court for Northern District of California. Case No. C15-02529 EMC. July 13, 2015. The City of Berkeley filed its response to the CTIA's challenge of the City's cell phone "right to know" consumer disclosure ordinance. and interfering with the ordinance is not in the public interest. The response was submitted by Berkeley City Attorney Zach Cowan, Harvard Law Professor Lawrence Lessig, Yale Law Professor and Dean Robert Post, and Yale Law Ph.D. candidate Amanda Shanor. Declarations of support for the ordinance were filed by Anthony Miller, Om Gandhi, Tom Jensen, and Sandra Cortesi. But Berkeley has no purpose to engage a scientific debate through political means. Its Ordinance simply reinforces a message that the Federal Communications Commission (“FCC”) itself already requires manufacturers to disseminate. The Ordinance is a response to data demonstrating that Berkeley residents are unaware of the information that the FCC desires them to have. Berkeley residents do not understand that cell phones are tested at a “body-worn distance” and are not aware that carrying a phone against one’s body “might result” in “exposure in excess of [FCC] limits” … The Ordinance also responds to data that a significant proportion of Berkeley residents want this information (82%) and said that it would affect their behavior (80%). The Ordinance thus answers a desire of Berkeley residents to have the information about RF exposure limits that the FCC wants them to have. Yet on the basis of a single paragraph in a single FCC Notice of Inquiry cited by Plaintiff more than a dozen times, CTIA insists that no government can have any legitimate purpose in making consumers aware of long established RF guidelines—the very instructions and mandates that CTIA’s members must meet and must disclose—because, in CTIA’s view, these precautions are too cautious. Important filings in the case are available on Scribd at http://bit.ly/CTIABerkeleyfile. On June 8, 2015, CTIA—The Wireless Association filed a lawsuit and a motion for an injunction in the Federal District Court in Northern California against the City of Berkeley to block the city’s cell phone “right to know” ordinance. This model law which was drafted by two of nation's leading legal scholars was designed to withstand legal challenges from industry. “…the FCC—consulting with expert federal health and safety agencies and drawing from international standards-setting bodies—has carefully reviewed the scientific studies that have examined cell phones for possible adverse health effects, including health effects from the radio waves—a type of radiofrequency energy (“RF energy”)—that cell phones emit in order to function. The FCC has determined, consistent with the overwhelming consensus of scientific authority, that “[t]here is no scientific evidence that proves that wireless phone usage can lead to cancer or a variety of other problems, including headaches, dizziness or memory loss.” FCC, FAQs –Wireless Phones, available at https://goo.gl/ZrKBly. "... CTIA respectfully requests that this Court preliminarily enjoin all Defendants from enforcing or causing to be enforced Berkeley Municipal Code Chapter 9.96 before the Ordinance goes into effect on June 25, 2015, pending final judgment." The lead attorney for the CTIA is Theodore Olson, a former United States Solicitor General who is best known for representing presidential candidate George W. Bush in the Supreme Court case Bush v. Gore, which ended the recount of the contested 2000 Presidential election. He is currently working for Gibson, Dunn & Crutcher. Lawrence Lessig, director of the Edmond J. Safra Center for Ethics at Harvard University and professor of law at Harvard Law School, drafted the cell phone “right to know” ordinance along with Robert Post, dean and professor of law at Yale Law School. Professor Lessig presented the ordinance to the Berkeley City Council on May 11 and offered to defend it pro bono against any legal challenges. The CTIA lawsuit is available at http://bit.ly/CTIAfiling6-8-2015. The court filings for the lawsuit, "CTIA - The Wireless Association v. City of Berkeley et al." (Case Number 3:150-cv-02529), are available at Law 360. The Berkeley cell phone "right to know" ordinance takes effect on June 25th, 30 days after its second reading. The Berkeley City Council adopted the Cell Phone "Right to Know" Ordinance after a second reading this evening. Recommendation: Adopt second reading of Ordinance No. 7,404-N.S. requiring cell phone retailers to provide a notice with each sale or lease concerning the carrying of cell phones, and adding Berkeley Municipal Code Chapter 9.96. Action: Adopted second reading of Ordinance No. 7,404-N.S. for exposure to RF radiation. This potential risk is greater for children. about how to use your phone safely." The entire text of the Ordinance is available at: http://bit.ly/Bklyordinance. Kevin Kunze, director and writer of the award-winning film, "Mobilize: a Film about Cell Phone Radiation," prepared a a 6 minute video about the adoption of the nation's only cell phone "right to know" ordinance by the City of Berkeley on May 12, 2015. These exposures are a rapidly growing form of environmental pollution worldwide. As of today the petition has been signed by 200 EMF scientists from 40 nations. Seventy non-governmental organizations (i.e. non-profits) have endorsed the Appeal. For more information about the International EMF Scientist Appeal, see EMFscientist.org and http://www.saferemr.com/2015/05/international-scientist-appeal-on.html. *(e.g., power lines, cell phones, cordless phones, Wi-Fi, wireless devices, cell towers, wireless utility meters). Harvard Law Professor Lawrence Lessig helped draft the ordinance and presented it to the Council on behalf of city staff. The only opposition to the ordinance came from the CTIA--The Wireless Association. The CTIA claims that consumers would be scared if they were directed to read the information that the FCC requires they provide to consumers. Ellen Marks is Executive Director of the California Brain Tumor Association. Recommendation: Adopt first reading of an Ordinance requiring cell phone retailers to provide a notice with each sale or lease concerning the carrying of cell phones, and adding Berkeley Municipal Code Chapter 9.96. 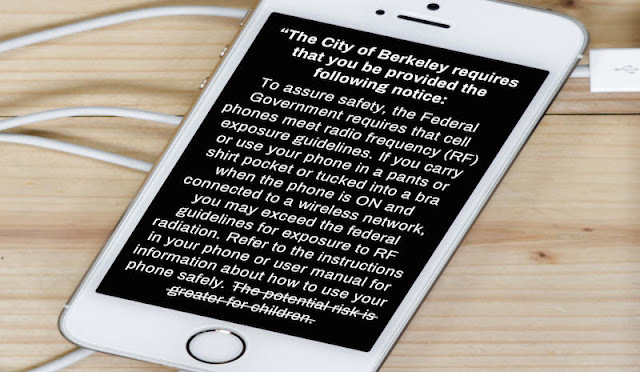 The City of Berkeley requires that you be provided the following notice: To assure safety, the Federal Government requires that cell phones meet radio frequency (RF) exposure guidelines. If you carry or use your phone in a pants or shirt pocket or tucked into a bra when the phone is ON and connected to a wireless network, you may exceed the federal guidelines for exposure to RF radiation. This potential risk is greater for children. Refer to the instructions in your phone or user manual for information about how to use your phone safely. B. The notice required by this Section shall either be provided to each customer who buys or leases a Cell phone or shall be prominently displayed at any point of sale where Cell phones are purchased or leased. If provided to the customer, the notice shall include the City’s logo, shall be printed on paper that is no less than 5 inches by 8 inches in size, and shall be printed in no smaller than a 18-point font. The paper on which the notice is printed may contain other information in the discretion of the Cell phone retailer, as long as that information is distinct from the notice language required by subdivision (A) of this Section. If prominently displayed at a point of sale, the notice shall include the City’s logo, be printed on a poster no less than 8 ½ by 11 inches in size, and shall be printed in no small than a 28-point font. The City shall make its logo available to be incorporated in such notices. C. A Cell phone retailer that believes the notice language required by subdivision (A) of this Section is not factually applicable to a Cell phone model that retailer offers for sale or lease may request permission to not provide the notice required by this Section in connection with sales or leases of that model of Cell phone. Such permission shall not be unreasonably withheld. Berkeley, Calif. April 30, 2015. Eighty-two percent (82%) of adults in Berkeley, California reported in a recent survey that they want to be informed when they purchase a cell phone about the manufacturer’s recommended minimum distance that the phone should be kept from the user’s body. On May 12, the survey results will be officially presented to the Berkeley City Council when the Council votes on a Cell Phone “Right to Know” ordinance. The proposed Cell Phone Right to Know legislation requires cell phone retailers to provide a city-prepared handout to each consumer at the point of sale that advises them of their phone’s manufacturers’ own directive to never wear or use a cell phone against their body when on (as in a shirt or pants pocket or tucked into a bra). This manufacturer’s separation distance use advisory which is required by the Federal Communications Commission is currently located in the legal fine print of user manuals or on the phone in text menus which are difficult to find. If the Council adopts the ordinance, Berkeley will become the only city in the U.S. to require retailers to provide consumers with this important safety information. Harvard Law Professor Lawrence Lessig who helped draft the ordinance will present it to the Council on behalf of City staff. Professor Lessig has offered to defend the ordinance pro bono should the CTIA—The Wireless Association file a lawsuit against the City. Fully, 70% of Berkeley adults were unaware that the government’s radiation tests to assure the safety of cell phones assume that the phone would not be carried against the user’s body, but instead would be held at least 1 to 15 millimeters from the user’s body. Two out of three (66%) were unaware that cell phone manufacturers recommend that their cell phones be carried away from the body, or used with hands-free devices. Fewer than one in six (15%) have seen the recommendations by cell phone manufacturers about how to best protect against overexposure to cell phone radiation. Almost three out of four (74%) reported that they or their children carry a cell phone against their body—tucked in a shirt or pants pocket while the phone is switched on. Recent peer-reviewed research has found that cell phone radiation causes sperm damage. The authors of a systematic review and meta-analysis of ten studies on the effects of mobile phone radiation on human sperm quality concluded that, "Our analyses indicate negative associations between mobile phone exposure on sperm viability and motility.” (Adams et al., 2014). “Keeping the cell phone in a trouser pocket in talk mode may negatively affect spermatozoa and impair male fertility” (Agarwal et al. 2009). “Overall, these findings raise a number of related health policy and patient management issues that deserve our immediate attention. Specifically, we recommend that men of reproductive age who engage in high levels of mobile phone use do not keep their phones in receiving mode below waist level” (De Iuliis et al., 2009). The City Council meeting will be held 7:00 PM on May 12 in the City Council Chambers at 2134 Martin Luther King Jr. Way, Berkeley. Supporters of the ordinance will hold a rally in front of the building at 6:00 PM. The survey of Berkeley residents was conducted by Public Policy Polling of Raleigh, North Carolina from March 6-8, 2015. The survey was funded by the ​California Brain Tumor Association. On Tuesday, May 12, the Berkeley City Council will vote on becoming the first city in the nation to enact legislation to give consumers information at the point of sale as to the recommended distance information which is currently hidden in the cell phone or in the manual. Harvard Law Professor Lawrence Lessig helped draft the ordinance and will be at the meeting to present it to the Council. Advocates for the ordinance will hold a rally in front of City Hall at 6 PM. For more information see Berkeleyside Events Calendar. NBC Bay Area aired a four minute news story on the 11:00 news, "Documentary 'Mobilize' Examines Cell Phone Dangers," about the Berkeley cell phone ordinance and the feature-length documentary, "Mobilize: A Film about Cell Phone Radiation." The cell phone "right to know" ordinance will be on the agenda of the Berkeley City Council meeting on Tuesday, May 12. On November 18, the Berkeley City Council adopted a referral to the City Manager on a 7-2 vote. The referral asks the City Manager to draft a cell phone “right to know” ordinance. Once this ordinance is enacted, Berkeley will become the first city in the nation to require cell phone retailers to provide those who purchase a new phone an informational fact sheet. Retailers will be required to provide the fact sheet to those who purchase a cell phone which informs them to read the user manual to learn the cell phone’s minimum separation distance from the body. The FCC requires manufacturers to provide this information to ensure that the consumers’ cell phone radiation exposure does not exceed the amount when the cell phone was tested. Few consumers are currently aware of this safety information because it is buried in their user manual or within their smart phone. Knowledge of this information is an important step in increasing awareness that cell phones should not be used next to the body. Councilman Max Anderson who sponsored the referral grilled the CTIA representative, Gerard Keegan, about why the industry does not want consumers to see the safety information that the FCC mandates. The CTIA position is that this is between the FCC and the industry, and the FCC is in the process of deciding whether this information is necessary so the City should not act on this issue. The referral directs the City Manager to ask City Attorney Zach Cowan and Harvard Law Professor Lawrence Lessig to draft the ordinance. A video of the meeting is now available for streaming (see 01:44:50 - 03:36:25). Summaries of the meeting have been published by The Daily Californian and the Contra Costa Times. The Berkeley City Council postponed discussion of the cell phone "right to know" ordinance until Tuesday, November 18, 2014. Recommendation: Refer to City Manager for the creation of an ordinance to have cell phone retailers give to consumers who purchase a phone, a factual, informational handout referring the user to their cell phone manufacturers' disclosure regarding the recommended separation distance for use against the body. This cell phone "right to know" ordinance is on the consent calendar for the Berkeley City Council meeting to be held on Tuesday, October 28, 2014. The referral and briefing document are available at http://bit.ly/BerkeleyReferral. "The Federal Government requires that cell phones meet radio frequency (RF) exposure guidelines. Don't carry or use your phone in a pants or shirt pocket or tucked into a bra when the phone is turned ON and connected to a wireless network. This will prevent exposure to RF levels that may exceed the federal guidelines." "Refer to the instructions in your phone or user manual for the recommended separation distance." Stakes in this argument are extraordinarily high. Cell phones are radio transmitters that are not only ubiquitous, they are close at hand: We press them against our ears. We store them in our pants pockets. Women slip them into their bras. Teens sleep with them under their pillows. With the adult market nearly saturated, the big growth opportunity for mobile devices is children. The CTIA statement builds a case that the “scientific consensus” is firmly in their camp. In fact, the two-word term appears 28 times in their filing. They quote numerous federal agencies asserting a lack of evidence that cell phone radiation can cause harm. Among them is the FCC itself, the FDA, and most notably, the National Cancer Institute, which states on its web site that “there is no evidence from studies of cells, animals, or humans that radiofrequency energy can cause cancer. Moskowitz dismisses the endorsements. “Industry and government agencies seem to be in denial, and have been in that frame of mind for decades,’’ he says. ... Cell-phone makers in their fine print do advise keeping these devices about a half-inch away from your body, although there is no mention of it in an industry-written parents’ guide to cell phone safety. And meanwhile, let’s face it: We just love these little appliances. They are changing the way we live. If they are changing the way we die, we’ll find out, eventually. Joel Moskowitz, head of UC Berkeley's Center for Family and Community Health, has no such indecision. He's been studying the issue since 2009, and has concluded that cell phones are "one of the top emerging public health risks." Studies cited by the cell phone industry are outdated, he said. Newer and more complex wireless technology, coupled with people spending increasing amounts of time on their phones, is almost certain to lead to an uptick in brain cancer, he said. "It's just a matter of time," he said. "The evidence is a lot more compelling than it has been." Radiation from cell phones penetrates the skin and skull and absorbs into the brain tissue, having an adverse affect on cells, he said. Phone radiation can also affect sperm count among men who carry phones in their pockets, he said. Consumers should wear headsets, use the speaker feature and otherwise keep phones away from their bodies, he said. "With cell phones, distance is your friend," he said. Pregnant women and children are particularly vulnerable, he said.